This book encompasses two large volumes, which gives a hint to its nature as a reference book rather than light reading. It contains chapters focusing on the more common extremophiles types – alkaliphiles, halophiles, thermophiles, piezophiles, psychrophiles, xerophiles, toxitolerants, marine subsurface organisms, radiation resistant organisms, and oligotrophs. 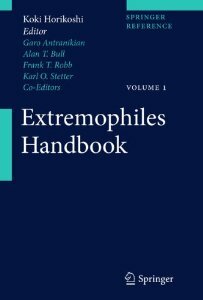 There are other extremophile types such as acidophiles, cryptoendoliths and osmophiles which do not feature in this book, so although this is an extensive tome it is not entirely comprehensive. I would not recommend this book for those without some biological knowledge in order to fully understand all the information contained in these volumes. During reading it often feels like a group of individual papers have been pressed together to form a chapter, rather than being written fluidly for the purpose of a book chapter. However, for those with some biological knowledge and an interest in extremophiles this book is very thorough and offers a lot of valuable knowledge. At the beginning of each chapter there are often personal stories from researchers about their experiences of working with extremophiles, which presents a gentle and informal introduction into each extremophile group. There is a lot of repetition of basic information at the beginning of each sub-chapter, which may be beneficial for those only interested in one aspect of an extremophile. However, if a reader is only interested in one aspect it is likely that they are already aware of the basic information. A lot of the book contains information on the taxanomic distribution of extremophiles in specific environments that is of more interest to biologists than astrobiologists. In regards to astrobiological interests the book does emphasise the limits of the physiochemical world for organisms similar to terrestrial organisms. There are numerous sub-chapters that investigate how extremophiles cope with extreme conditions including research into specific physical attributes that are of interest to astrobiologists. However, I would not recommend this book for those wanting to grab a few quick facts about a particular species or extremophile type as this is not easy to find within each chapter. For example, there is no quick way to get certain facts like the current upper limit of pressure for piezophiles. As the writing style is more like an essay it is enjoyable to read, however, it does not really work as a comprehensive database or an easy to read “outreach” book. In conclusion, this book is not for the faint-hearted and would probably only be read cover-to-cover by those working with extremophiles. I would recommend astrobiologists only read specific chapters relevant to the organisms or coping mechanisms of interest, or perhaps read the introductory chapters for each extremophile type in order to get a general idea of the potential for terrestrial organisms to inhabit extraterrestrial environments.